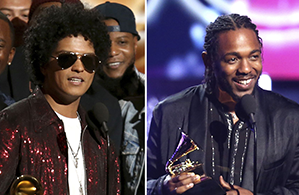 Bruno Mars swept the 2018 Grammy Awards on Sunday (28Jan18) as 24K Magic was crowned the surprise winner of both Album and Record of the Year. The critically-acclaimed release was also named Best R&B Album, while That's What I Like earned the Song of the Year, Best R&B Performance, and Best R&B Song honours - helping the singer pick up every prize he was nominated for. 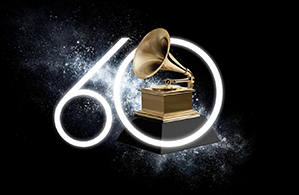 Kendrick Lamar, who opened the ceremony with U2's Bono and The Edge, dominated the rap categories with Best Rap Album for DAMN., Best Rap Performance and Best Rap Song for HUMBLE., and Best Rap/Sung Performance for LOYALTY. The two stars' big wins meant JAY-Z, who led the way with eight nominations heading into the event at New York's Madison Square Garden, was completely shut out, emerging empty-handed. He did, however, receive the 2018 Salute to Industry Icons Award at Clive Davis' Pre-Grammy Gala on Saturday (27Jan18). Among the other winners, Chris Stapleton landed a trio of accolades, and Ed Sheeran, who was not in attendance, was a double honouree. Meanwhile, Kesha was given a standing ovation after joining forces with Cyndi Lauper, Camila Cabello, Julia Michaels, Bebe Rexha, and Andra Day to deliver her powerful song Praying, making a statement against sexual misconduct and the abuse of power in the music industry.